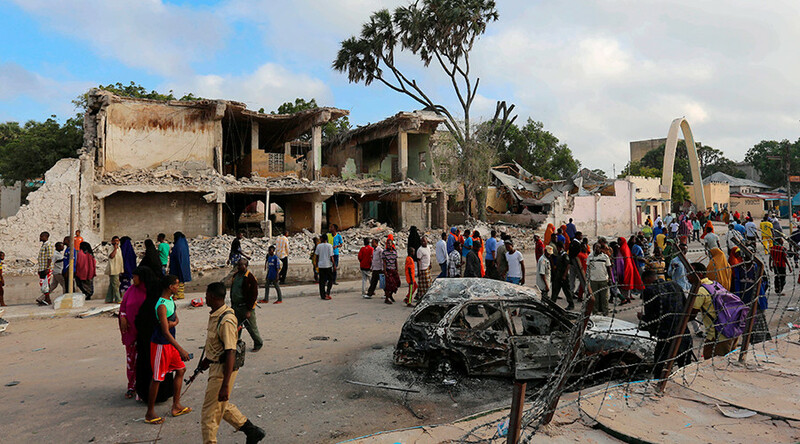 At least 30 people have been killed and 40 others injured in twin suicide explosions carried out by Somalia’s Al-Shabaab terror organization, an Al-Qaeda splinter group, in south-central Somalia, according to police. The blasts rocked the center of the city of Baidoa, targeting a busy spot near a restaurant. “The restaurant and the junction were very busy and the death toll may rise,” Reuters quoted the Police Major Bilow Nurr as saying. The targeted city is located about 245 kilometers (152 miles) northwest of Mogadishu, the capital of Somalia. Thirty people were killed, with another 40 wounded, police Colonel Abdi Osman confirmed. The police official added that one bomb had blown up at the junction, while another explosion had targeted the restaurant. Hospital employees said that some of the bodies they received were unidentifiable due to horrible charring. The Al-Qaeda-linked Al-Shabaab terror group claimed responsibility for the attack, with the group’s military operation spokesman Sheikh Abdiasis Abu Musab stating: “We targeted government officials and forces,” as reported by Reuters. According to Musab, a police station was located nearby. The attack comes just of days after Al-Shabaab fighters killed 14 people when they set off a car bomb and stormed the Somali Youth League hotel, also known as the SYL hotel, located in the heavily secured area near the presidential palace in the center of Mogadishu. The extremists group is fighting against Somalia’s Western-backed government, with the goal of imposing a strict version of Islamic law.